Ask any photographer what their ideal camera bag would look like and many will tell you it's the one they have not found yet. All photographers have different requirements. There are many factors to consider when looking for a new camera bag; camera sizes, how many lenses, does it need to house all my kit or is it for a specific job, am I wanting extra room for filters, flash guns, tripod; do I need it to be just a dedicated camera bag or a muti-use bag too; as a daybag carrying clothing or even a packed lunch? 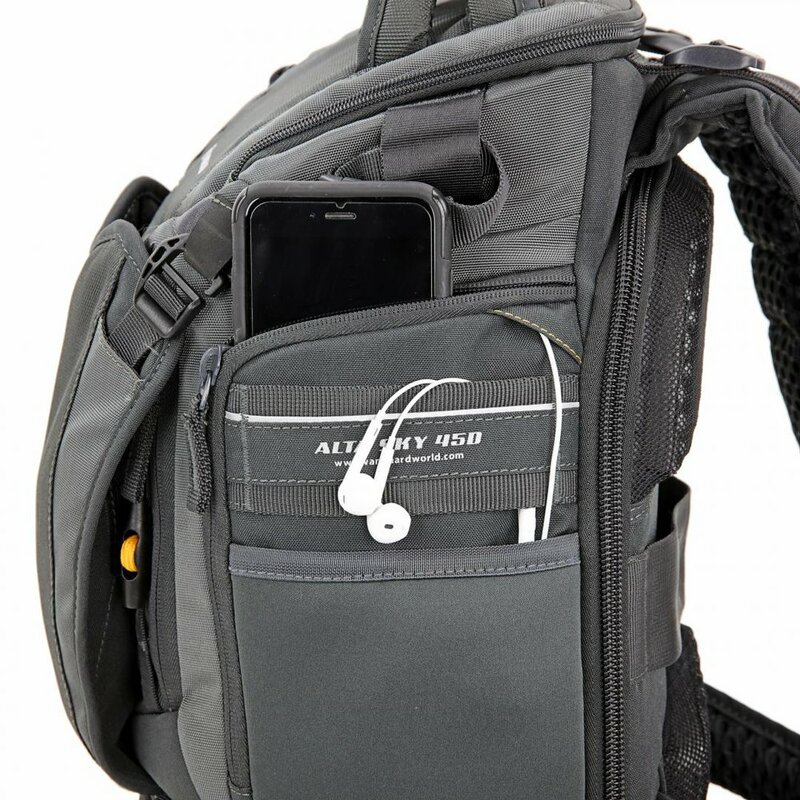 "The ALTA SKY 45D is the ultimate gear-carrying and working backpack. Featuring innovative 1/3-2/3 division the versatile set-up will allow you to decide just how much backpack capacity and how much daypack storage you need. Max storage can fit up to a Pro DSLR with attached lens (up to 70-200mm f/2.8), 2-3 lenses, a flash and accessories + CSC (Compact System Camera) with additional lens. Also carries 13" laptop and/or tablet and offers various advanced tripod connections." Upon receiving the Vanguard Alta Sky45D, it struck me how light it was. Being a keen ultra lightweight camper/walker/photographer, weight is a huge issue for me. I use lightweight gear whenever I can. I've done it; a weekend walking up hills with a 15kg rucksack and tripod is no fun. Try walking up a scree slope with that strapped to your back and you soon learn how to pack light. My camera system therefore is the first place I save size and weight I use is the Olympus OMD Em5 Mk2 which is a mirror less csc range; it is much smaller and lighter than your conventional DSLR and that goes with my range of lenses too. So when I received this back I was pleasantlysurprised with how light this bag is, it is a real plus for me. I weighed it on the scales and it comes in at less than 2kg which is great considering it's build and padding. The overall look and quality of the material and stitching is good, very neat, it gives an impression of quality and durability. On first look the design and layout looks interesting and so I will explore this in a little more depth later in the review. The main features and benefits are listed in Vanguard description above so there seems little point repeating this; what I will focus on is how I would use this bag in real life and if it satisfies my requirements. Before I get into that however lets look at the bags layout; there seems to be four individual access points to the main body of the bag which is essentially one compartment with moveable and removable Velcro fixed compartment walls. Firstly, I will describe Vanguard's default configuration as it was sent to me. The top access point reveals a small compartment useful for things such as filters, spare batteries etc. The side access zip flap reveals the main body of the bag with quick access to your camera and fixed lens, if that's how you wish to use it, the flap has a little double pocket for memory cards. 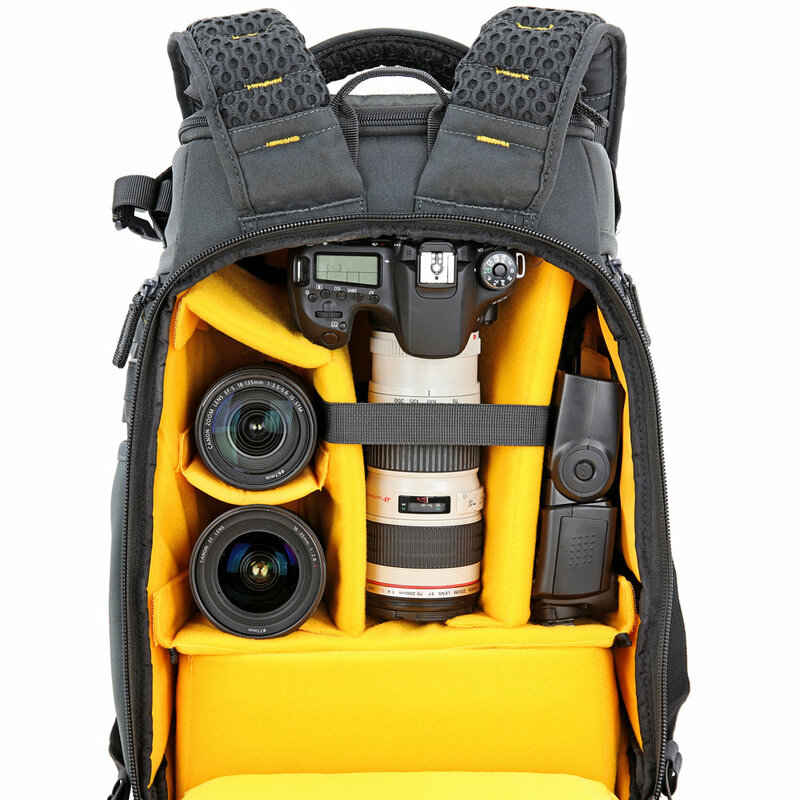 The rear access reveals all of the main section compartmentalized into space for camera lenses, flash etc. The bottom access zip reveals a section for maybe a csc camera body and sections for possibly four prime lenses. On the front of the bag is a curious flap with a rain cover stowed within that folds down to reveal two cross straps obviously to strap a tripod to with the legs going in the pocket of the flap making it really secure. The flap can also apparently be used to strap a drone to the outside too! We shall see! Looking around the bag there are lots of little pockets to store smaller items, a pocket for your mobile phone with a headset port for the cable to pass through to the outside meaning your can walk and listen to your music. Other noticeable things are the features of a typical travelers backback;such as both waist and chest straps and a cushioned breatheable back pad. All good! One thing that I did like is the hard solid base so you can actually stand the bag upright on the ground without it falling over. So, now you get a feeling for how the bag is configured I will set it up as I would typically use it. So what do I need my camera backpack to do? a divide of day trip essentials and a selection of camera gear. Hopefully this will give a good idea of what this bag is capable of. On such a trip I need to be prepared with a full range of lenses from wide angle to a long reach telephoto prime. If I was a regular dslr user this would mean I'd need a huge backpack to house it all. A 600mm lens in the full frame dslr world is nearly as long as your arm! Thankfully, however, I shoot micro four thirds which is a crop sensor, mirrorless and means the lenses are much more compact. The 300mm prime lens is only just over 9 inches long and is equivalent in focal length to a 600mm full frame. Well very easily actually with room to spare. the camera went in the bottom compartment as before with spare space. The top of the bag remained empty. I removed some of the padded compartmentsin the main back section for the waterproofs, fleece and packed lunch. Water went in the side pocket and tripod once again strapped to the back using the fold down flap. It is pretty obvious that this is a very capable bag. If I was looking for a multi purpose bag then this is a real contender. For my usual landscape/nature shoots it seems just about perfect; big enough to carry all my kit and very comfortable even when fully loaded. It seems to me Vanguard have designed the Alta sky45d with people like me in mind; it's a good mix of great protection, versatility and practicality. The way the bag can be completely stripped of the dividers and organized to suit the user is genius. The different entry points means you can divide and organize your kit with immediate access therefore not losing any time and not missing that shot; you know where everything is and is accessible with no rummaging around trying to find what you need. The number of pockets is great for those little things such as memory cards and batteries and there are plenty of external straps and options to where to strap your tripod or camping equipment. For the rare occasion that I would take both camera gear and drone this does work. The drone straps to the back and is easily carried, however, once on I feel the bag is really reaching it's capacity and limitations. 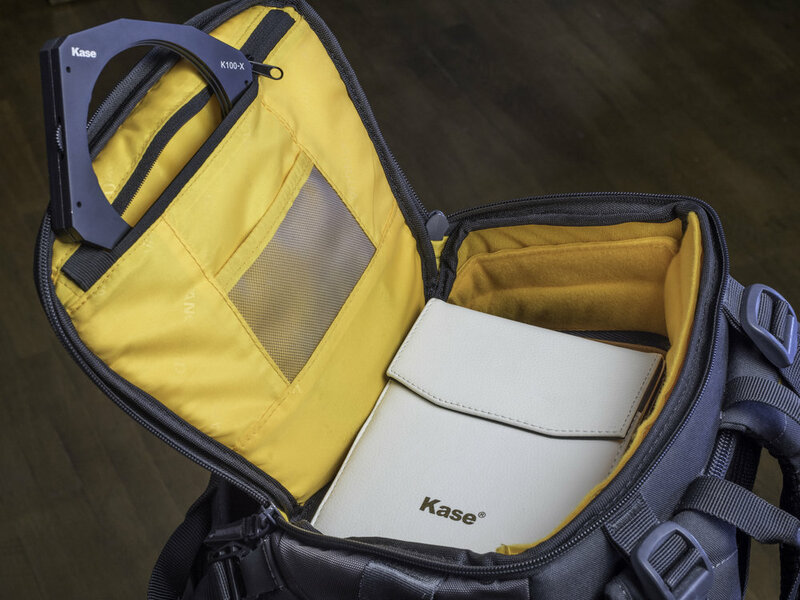 I did notice on their website that they do offer a slightly larger version of this bag allowing the drone to be carried and protected on the inside main section of the bag. This they call the Vanguard Alts Sky51D. If I was regularly taking my drone out with my camera gear, I may be tempted to go for the bigger version. The 45D is perfect for my camera system being slightly smaller however if I was a full frame or even APSC user then I'd definitely go for the larger 51D option. It's seems to be exactly the same in design just slightly bigger. As a multi purpose 50/50 camera gear and walking day bag it's just perfect. Plenty of space when configured to carry your day kit in the main section with spare room in the top and camera compartment at the bottom. The useful rain cover also gives a feeling of security for your kit too.